My first centering prayer word was grasp. It was worn, tested, tried, and true. I repeated it probably millions of times over those earlier years when I first fell in love with the spiritual discipline of silence, of making room for God to move in ways that involved only clearing my mind, cultivating a space, and ushering in a countercultural reverence for stopping when the world refused to stand still. But abide, my second prayer word that I adopted only a few years ago, seemed to signal real growth and maturity. Instead of so presumptuously grasping for God or even sagely realizing it is God who grasps for us, abide was the mere act of being in God’s presence or letting God’s presence wash over me. I was proud of the attention, discipline, and even inaction it signaled, the way it chafed against a busy world, busy lives, a busy me. Perhaps that’s why I’ve never really been able to get my mind around this word, why I’m not so good at abiding, or even praying about it. I confess that recently my abiding has become dusty and decrepit, just like my centering prayer practice, beholden and bent to the cluttering of my life in which I’ve allowed little space for anything other than tasks and work and running–little space for silence, breath, let alone God. But there have been healthcare battles to fight, I rage in earnest! There have been surgeries, and new jobs, and mourning, and real kingdom work, God. You know where I’ve been. You know my heart. Surely my absence means little to you. And yet, in the recesses of my soul, God whispers more countercultural wisdom–that more can even be done with less rigor and muscle and strength. That, just as it’s been in the deliciousness of these last few mornings, when I’ve sat idle, letting the waking silence wash over me, I’ve felt most refreshed, most awake, most alive. There’s this mystery about life with God, how when we resort to doing wholly nothing, that nothingness becomes holy in its luxury and extravagance, a sacrifice, an intention, a heartiness that can’t be achieved or earned and is yet, so much purer and better and good than all my blustery days. And that openness gives life and purpose and wisdom to our work and our justice and our advocacy–it exceeds us, because it so importantly comes for God and not from us. Perhaps that Mary Oliver line should read, what is it that God will do with our wild and precious lives? Or at least that’s what I yearn to surrender to. For it is God who eternally waits on us, in silence, abiding in perfect patience, ever exceeding us lavishly with grace. A quiet morning on the beach with Lucia. This clever sketch with its caption, “A nativity scene without Jews, Arabs, Africans, or refugees,” has been circulating on social media. This season I’ve been intentionally quiet, quiet mostly in the mornings but also quiet on the blog. This Advent, I’ve tapped back into my practice of Lectio and Centering Prayer. I’ve been reading the prophetic scriptures from Isaiah and the journey to Bethlehem in Luke as the Syrian city of Aleppo crumbles, lives are lost, and great fear reigns throughout our world. I haven’t known how to respond to all the darkness, have you? I should speak out, I think, say something like Isaiah, the prophet, reminding us how to follow a God who is not of this world, a king who is not violent, but gentle and humble and an outsider. Is silence surrender in the face of such great evil, especially in a season that proclaims resounding joy, reconciliation, and peace? I strive to work for justice in fits and spurts, donating, signing petitions, calling my congresspeople, but in the mean time, in a faraway land from where our savior was born, I hope that my silence meets God’s faithfulness. You see, what I have always found so powerful about centering prayer is that I’m not doing anything–and that’s the point. Because if prayer is just one more thing that we do, let alone one more thing that I presume to muster of my own wisdom and accord, then it is anything but a holy offering or a right relationship to God. And so as we wonder how to respond, I wonder, whether as always, if it isn’t less about us and more about God–God’s saving action in the world? I am patient in this season to listen but not to listen without responsibility. I listen and trust and charge God with all God is always doing to offering healing, respite, and reprieve. And I wait for God to give me the words, the actions, and the steps to be an instrument of peace this Advent season. My little setup at the new home. My photo. If you’re interested, there are over 30 posts in the category “Centering Prayer” on the blog. Finally, I’d be interested in hearing from any of you who are struggling in waiting this season. It strikes me that waiting and silence feel particularly cheap in a season where this so much violence and need. What is God teaching you? Where is God leading you? As many of you who have been reading my blog during Lent have apprehended, I’ve been pretty transfixed by the simple instructions on spirituality in Richard J. Foster’s Celebration of Discipline. But the other day as I read through the final chapters of the book as I nursed my baby before sunrise, I realized that in the busy-ness of my mind and the eagerness of my heart, and despite the silence, I’d forgotten about listening. 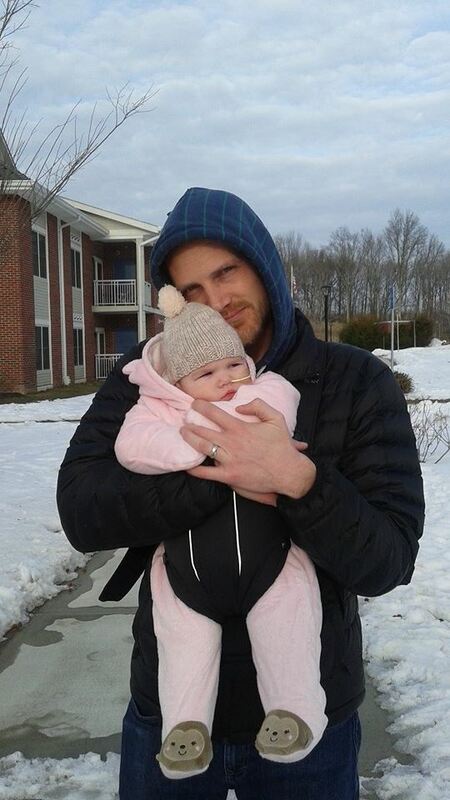 I’d forgotten that what sent me on this deep spiritual quest during Lent was the increase in silence in my life since the birth of this baby, and the subsequent invitation to let God fill those silences. Since that realization, I’d picked up Foster’s book in an effort to be more intentional about my spirituality, and therefore, I’d been the one filling the silence with all sorts of things, from counting precious hours of sleep to pondering the tasks for the day ahead, and even my devotional study. 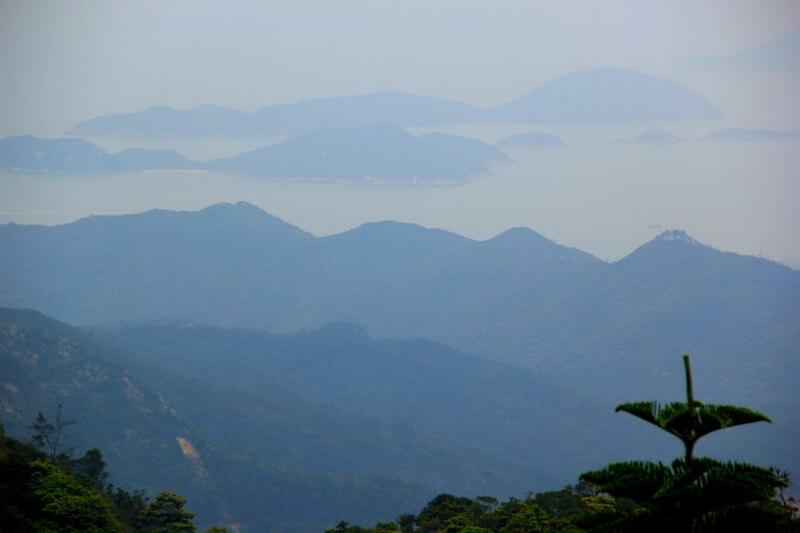 In my own post on “The God of Silence,” I talk about the value for me in practicing centering prayer and reframing the experience of silence not as one of absence but of presence. I still doubt over and over whether God will truly meet me in the silence. But what if God was already there? What if the essence of God was that God goes before us, is ever-present, always waiting on us when we call? 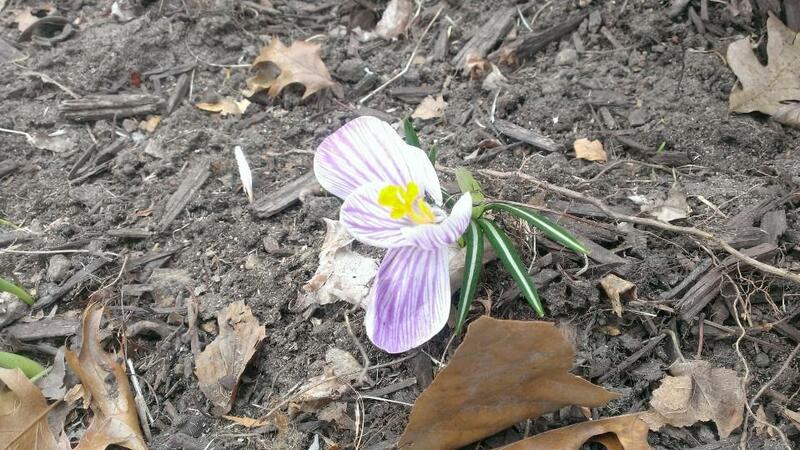 My sister’s photo of the first flower of 2014 in her neck of the woods. What a simple action, I thought, handing our worry and fear over to God, and yet we cling to these things as if we love them more than peace, hope, and love. Fear and worry, hunger and thirst, these are the little that Jesus asks of us, and yet we cling to our noisy lives with such cowardice. I don’t know about you, but the thought that our mighty God wants our heartache, and that God is so pure and humble and innocent and present, moves me. The least I could do is listen, right? And so I’m returning to that simple message on this foggy Tuesday morning. I’m returning to the silence with my ears attuned to the presence of God. I’m bringing my fear and my worry, my hunger and my thirst, and I’m trusting that God is already there, listening, as I listen for him. Have you ever doubted whether God was really there because God’s silence seemed to indicate otherwise? Have you ever cried out to God, wondering how God could remain silent in the face of hardship, pain, or injustice? Conversely, have you ever sat in a car or beside a friend or a family member in complete silence and felt deep companionship and comfort, but hardly any need to speak? Why is it that we can trust others with such deep, holy silences, and yet when we encounter silence in our spiritual lives, we assume that God is woefully absent? 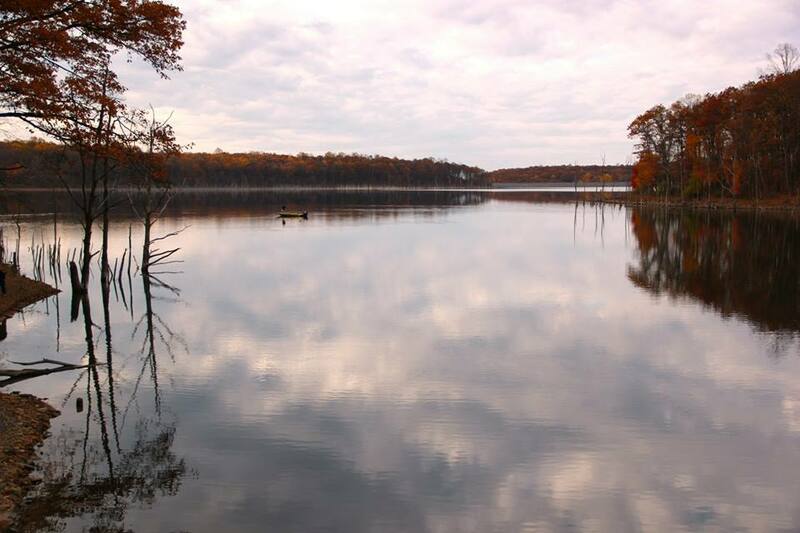 Merrill Creek Reservoir. Photo by Evan Schneider. One compelling aspect for me of adopting the discipline of centering prayer has been this reframing of the concept and experience of silence as the presence, rather than the absence of God in our lives. As Foster writes above, in the silence, God takes control from our greedy grasp, but God cannot do so if we refuse to trust God. During this time of Lent, I invite you to reflect on where God has been silent in your life, and how you might cede some control and trust to God in those areas. As you do so, imagine God’s hands, busily, yet quietly working. Believe that silence does not indicate God’s absence, but rather God’s presence, God’s faithful accompaniment to you, in deep, holy, silent communion. Trust that after those dark nights of the soul, the sun will rise on another, better morning. And find it in your heart to let go and trust God with all of your life. Even and perhaps, especially when you feel weak and utterly helpless, our God may be silent, but God is there. There’s been all sorts of talk about the value of the creative pause, the importance of sacred space (I swear I’ve linked to this article before, but it’s still great), and the benefits of meditation. And, predictably, especially given the title of this blog and its content, I couldn’t agree more! 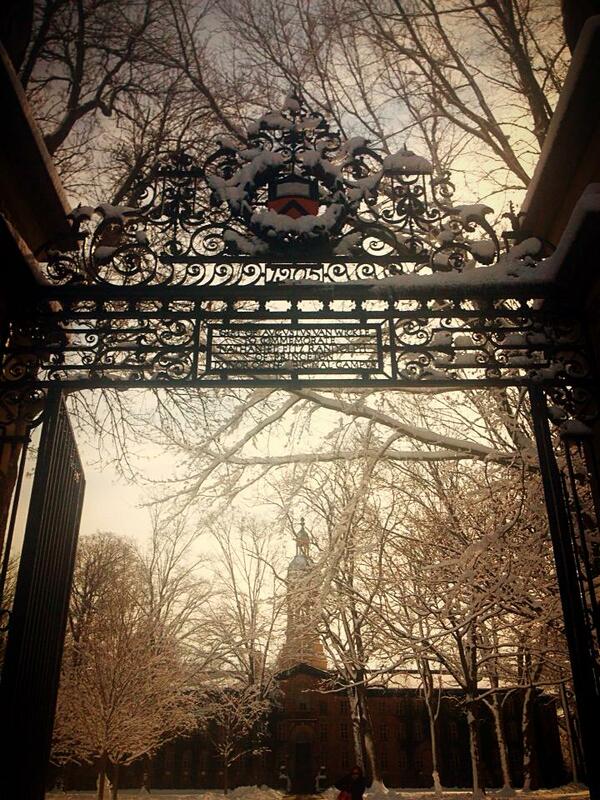 The snowy Princeton campus. Photo by Serena Stein. But I have to admit that I don’t always practice what I preach. While I’ve been wildly productive when it comes to the dissertation and ticking things off the baby-prep list, I’ve been flittering away downtime with a host of media distractions. This isn’t the end of the world, of course. Social media can be wonderfully connective, and much-needed breaks from the rigor of our working lives with tv, youtube, etc. are understandable. But when I think about what I really want to get out of life, I realize how much I don’t want to distract myself from what God’s doing. Rather than check out, I want to check in. And rather than emptying my mind, I want to be filled with the mind of God. Through the distractions, I hear God’s invitation to breathe a little deeper. And this morning as my dear friend and I sat basking in the word of God, simply breathing together, we felt anew how good it is to simply be in the presence of God. I don’t love the phrase, “carving out space for God,” because I think it’s misleading to suggest that we’re the ones who should be doing the carving. And yet, I think there’s something to be said for embracing the silence that God grants. There’s something to be said for choosing not to be distracted. And there’s certainly something truthful about remembering that the invitation to the spiritual life is just that, an invitation, which we can either accept, despite all its inconveniences, challenges, and grace, or decline for the meagerness of our own devices. 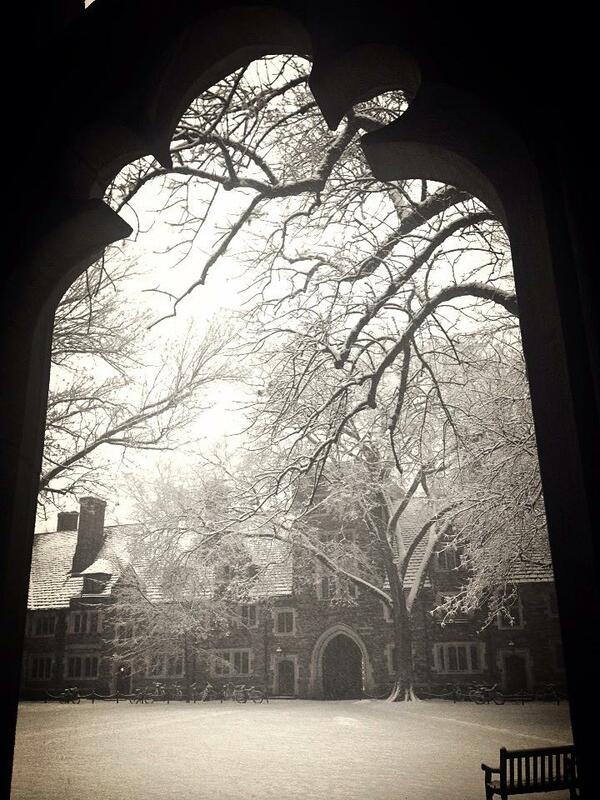 Pretty Princeton in the glow of snow. Photo by Serena Stein. How can you embrace the silence, the invitation from God in your life to breathe a little deeper today, tomorrow, and this year? **Check out The Huffington Post’s critique of the TIME article here. A few weeks ago a well-known anthropologist whose most recent book is about how evangelicals hear God speak came to campus. It was pretty thrilling to hear scripture read in the lecture hall where I’ve given fieldwork proposals and heard anthropological theory, and it was exciting to see my colleagues take seriously questions of faith and practices of prayer. But seeing as how evangelicals are claiming to hear God speak into their lives, and this has prompted Tanya Luhrmann to develop a new theory of the mind, in which people of faith train their minds to hear voices outside of their pysche, friends and colleagues eventually did ask me whether I hear God speak, audibly, as well. 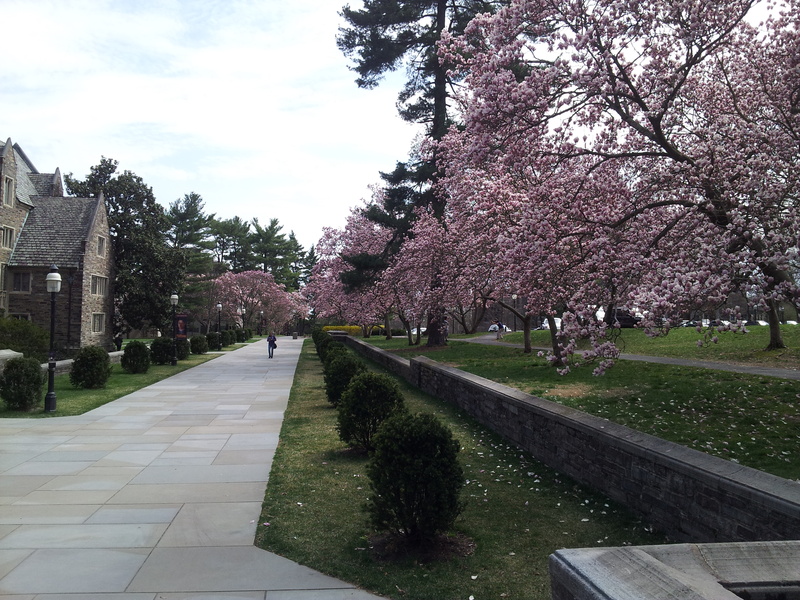 Spring on the Princeton campus. I don’t really. Not audibly. No burning bushes…yet. Sometimes, in fact, I don’t feel God at all, and I wonder if I’m “doing it all wrong.” If my faith tells me that God doesn’t draw lines between sacred and profane, like anthropologists, but that the Holy Spirit is in everything and everywhere, then why don’t I hear God speak like my evangelical friends? It probably has something to do with my prayer practices, as Luhrmann has posited, but it also probably has something to do with God’s great, unchangeable nature, a theology of waiting, and God’s work being not only life-changing, but counter-cultural. I’m not contesting a God who speaks–the Bible gives us plenty testimony to that effect, but I’m attempting to testify to a God who also speaks in the silences, in the pauses, through others, and behind the scenes. Did you ever wonder what happened in between Moses and God’s holy rendezvous, or Peter’s visions, or John’s breakfast with Jesus? Oh yeah, that’s right, the Israelites built a golden calf, Peter’s faith failed him in God’s darkest hours, and John and the others were straining to see the future of a movement that had lost their leader to death on a cross. But God, God hadn’t forsaken them. God was behind the scenes. And so, even as the Bible tells the story of God’s relationship with God’s people, our humanity makes us gravitate toward the loudest voices, the greatest triumphs, rather than the trials, the silence, the humility, the work behind the scenes. 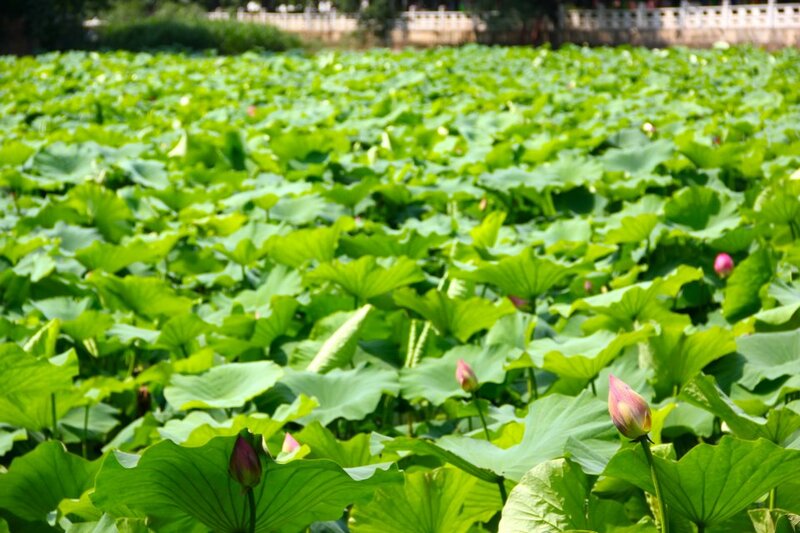 Water lilies in Kunming, China. Photo by Evan Schneider. What God does behind the scenes, however, is great, too. When we release ourselves to both God’s on stage and off stage work God subtly equips us in ways that go unnoticed until we find ourselves in our times of greatest trial, need, or joy. God’s work is not always showy or attention-grabbing, but if you look for it, it’s everywhere, in the little acts of kindness and justice that people lend to one another without fanfare or media blitzes, but with great humanity and care. There were handfuls of people healed in the Bible, whom Jesus had humbly go on their way, while he continued his own humble journey to the cross. I’m not suggesting that the God who speaks to you in prayer isn’t the same one that heals in secret, prays for us with sighs too deep for words, or equips with patience and diligence. Quite the opposite– they are, miraculously, one and the same. And yet, it’s simply clear why the loud, thunderbolt one gets our awe, astonishment, and praise. 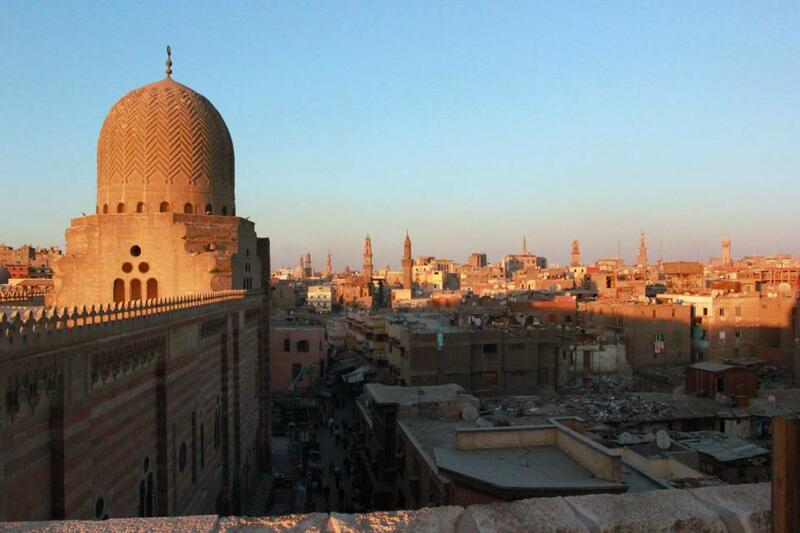 A view of Cairo, Egypt. Photo by Evan Schneider. For me, God, especially of late, is more behind the scenes, subtly, yet faithfully equipping, and speaking through those around me in voices of care, concern, and affirmation. I imagine that God was very much behind the scenes those horrific hours after the bomb blasts at the Boston Marathon. I pray deeply that God is behind the scenes for families in China who struggle to care for special needs children, or for places where bomb blasts are the stuff of everyday life. For me, knowing and believing that God is behind the scenes is the hardest part of faith and prayer and life. But it can also be the greatest comfort to find that even when God isn’t speaking, God is always there, behind the scenes. It’s just one of those weeks where despite the busy-ness, and the ups and downs, I’ve felt God’s presence so palpably, and I’m giving God praise. On Plymouth Harbor. Photo by Evan Schneider. I give God praise for speaking into the silence, for meeting us simply and whole-heartedly. I give God praise for listening ears and spiritual guidance on the journey. And I give God praise for fellowship. Last night I had a phone call with a few girlfriends from seminary in which we got to affirm one another’s call, talk through challenges, and pray together. 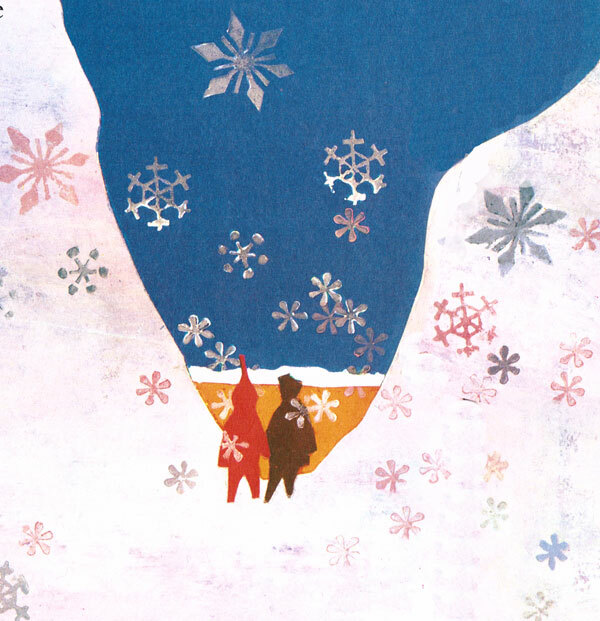 It reminds me how much we were meant as human beings to rejoice together–in community. And it made me realize all over again how powerful experiencing grace is, and how deserving of praise our God is for granting us grace. When we look around and can see God’s hand in our lives, let us not take that for granted–let us praise God.